Samsung Electronics has announced a new chip that will make it possible for the company and others to build smartphones and tablets with up to 4GB of RAM. 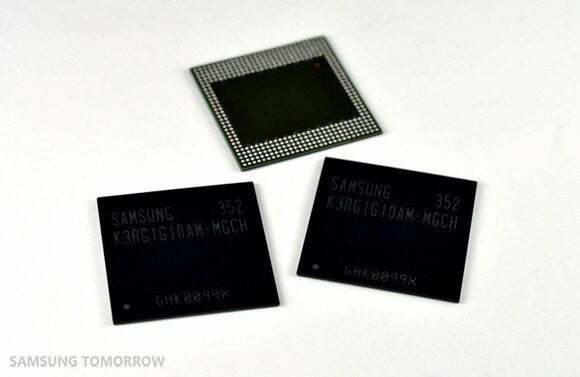 Samsung has developed the industry’s first 8 Gigabit LPDDR4 (low power double data rate) mobile DRAM. By combining four of them, a high-end smartphone or tablet can get 4GB of RAM, Samsung said on Monday. Today many expensive smartphones have 2GB of RAM, while Samsung’s own Galaxy Note 3 has 3GB. The memory increase and performance improvement offered by Samsung’s chip will result in faster, more responsive applications and will open the door for more advanced features as well as higher resolution displays, according to the company. The product also consumes less power than current memory chipsets, it said. The chip will start shipping next year and it will be used by large screen smartphones, tablets and ultra-slim notebooks, according to Samsung. Some of the devices will also have 4K or UHD screens, the company said without offering any product details. Other expected smartphone trends for next year are faster LTE network connections and faster processors. Qualcomm recently announced the Snapdragon 805 processor, which runs four cores at up to 2.5GHz and is expected to be available in commercial devices in the first half of 2014. Samsung is expected to show what its next-generation high-end mobile devices will be powered by at the International CES trade show in Las Vegas next week. Last week, the company posted a message on Twitter asking if followers were ready to unlock Exynos, which is what Samsung calls its mobile processors, on Jan. 7.